Why Are They Called Pontons? What are They Called Elsewhere? 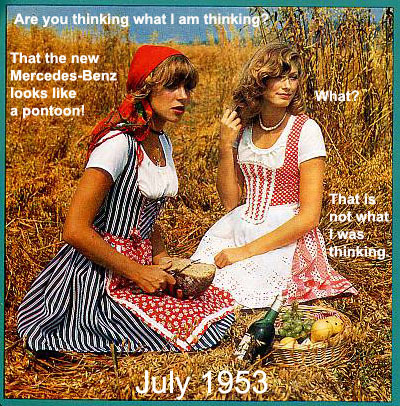 First of all, ponton is the German word for pontoon. When it is used in an automotive context, the word refers to the shape of the body. 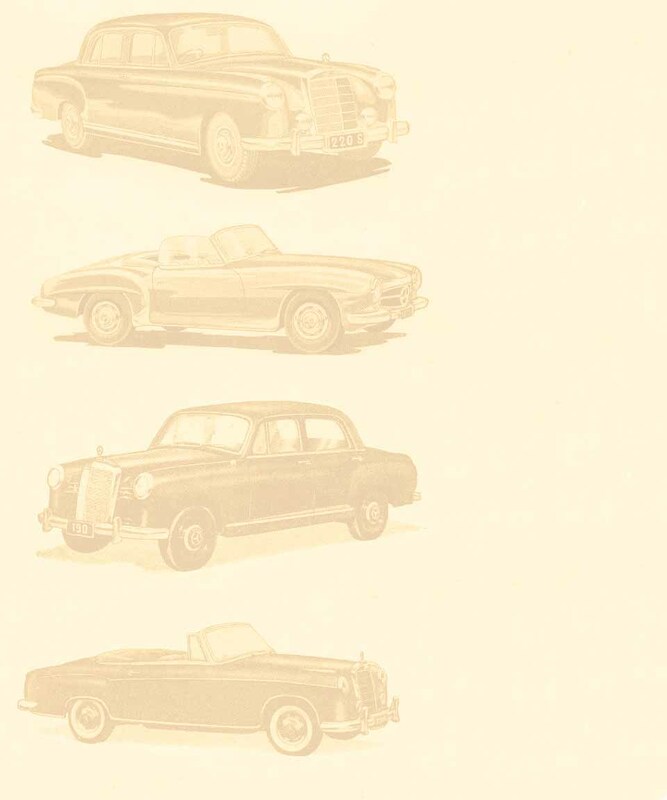 The term Pontonkarosserie (pontoon body) is also used in reference to other automobile marques of the same period such as Opel, Auto-Union (DKW), Borgward (Hansa) and more. In fact, the term was used in Germany for all vehicles of standard size, with front engines and rear trunks through the 1960s. It is unclear why this former general expression was later used exclusively by Mercedes-Benz enthusiasts. The term Pontonkarosserie made reference to the fact that in 1953, the appearance of these cars did not seem to follow pre-WWII design evolution. For example, the headlamps, which had been mounted atop large free-standing fenders on earlier models like the Mercedes-Benz Type 170, were now being integrated into the fenders, which themselves had become part of the whole body. 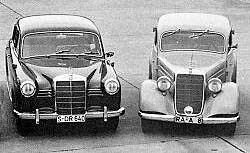 Left: Mercedes-Benz Type W120 180D Ponton sedan. The overall Ponton series was produced between 1953-1962. Right: Mercedes-Benz Type W136 170D sedan. The overall W136 series was produced between 1946-1955. These new cars retained a "family resemblance", but otherwise appeared over-inflated, slab-sided, flat, and rectangular in contrast with their more gothic predecessors. At the time, they were compared to the shape of a pontoon, and so the nickname was born. At the time of its manufacture, the real novelty of the car lay in its stressed unit-construction shell. This shell made it stronger and lighter than its predecessor, the pre-War Type 170S. At the front of this, there was a separate U-shaped sub-frame (a.k.a. "Fahrschemel"), rubber mounted to the shell at three points. It held the engine, gearbox, suspension and recirculating ball steering. One journalist likened this configuration to a pontoon bridge, which led to the cars being known as the "Ponton" Mercedes. 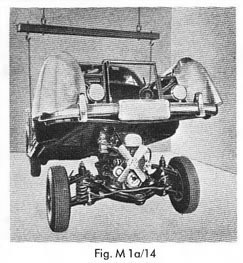 The design of the sub-frame facilitated removal of the engine, gearbox, suspension and recirculating ball steering as a single unit from beneath the vehicle. View the Engine Removal page.